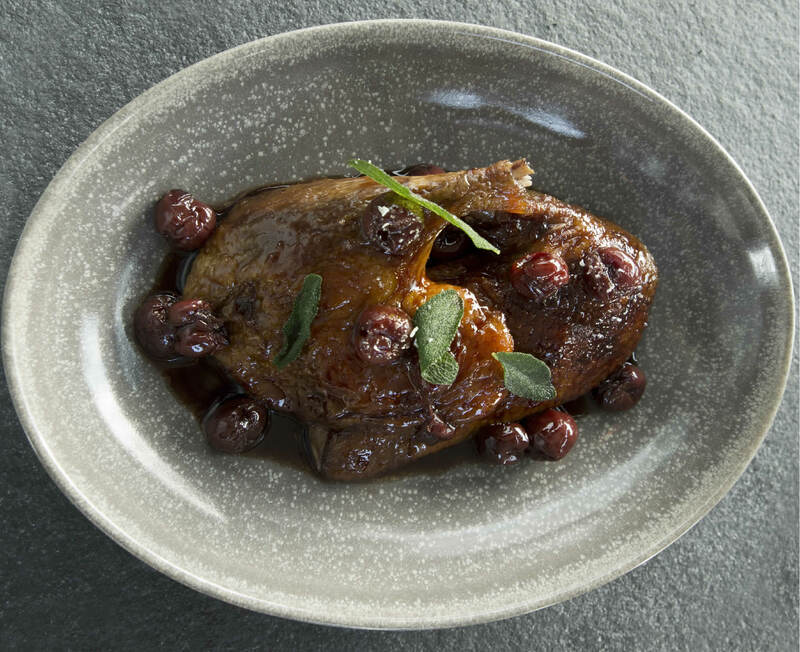 If you cant be bothered cooking your own whole duck there are some other options out there, you can buy really nice ready confit duck legs or get a chinese duck which is fantastic with this recipe. Trim the excess fat off the duck then roast in oven breast side up at 200’C for twenty minutes, then reduce the heat to 180’C and cook for a further 40 minutes. Rest in ambient temperature until cool, remove the duck breast and then legs. Remove the thigh bone from the leg by snipping and pulling out. Reduce the cherry syrup by 2/3rds add in pomegranate and beef stock, reduce by half. Add in the duck skin side down, continue to cook until the sauce becomes syrupy. Heat the canola oil in a pan, shallow fry the sage until crispy. Place breast and legs on the plate. Garnish with cherries, sauce and crispy sage.